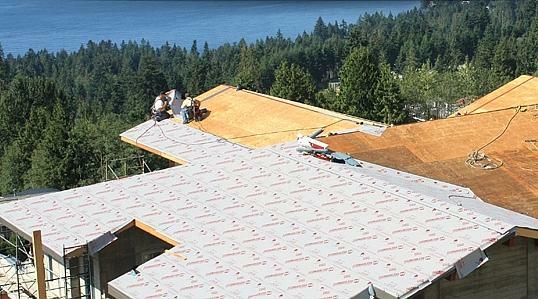 PRODUCT: Titanium PSU-30 Peel/Stick Synthetic Roofing Underlayment, Ice and Water Shield Grade, High Temperature. 3 x 72 ft. Roll (~ 2 Square). Price/Roll. 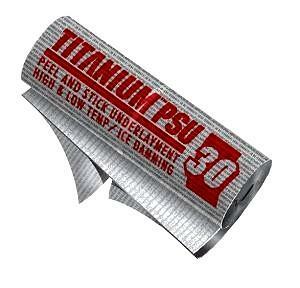 Titanium PSU-30 is a modified rubberized asphalt Peel & Stick Underlayment with a tough, rugged surface and a self sealing lap system! Designed for 2:12 or greater sloped roof applications subject to the effects of ice damming and wind driven rain. Titanium PSU-30 rubberized asphalt delivers a unique combination of both high temperature (240°F / 115°C) flow resistance, and low temperature (40°F /5 ° C) deck adhesion "All Temp " performance. Titanium PSU-30 possesses a lap seal system which forms an impervious asphalt to asphalt bond at overlapping seams, delivering superior waterproof protection. MFM Ultra HT Wind & Water Seal Underlayment. High Temperature Peel and Stick / Self Adhering underlayment with a non-slip cool white polymer film. 3 x 67 ft./Roll (2-square). Price/Roll.